Starbucks!! Say no more right? America’s favorite daily guilty pleasure. Oh so so sorry Starbucks, but your chai latte will never be the same! India… you had me at tea time! It was so much more than “just” a cup of tea. Traveling to India with SkillCorps certainly did not come without having some serious reservations. I had many questions, such as “How do we make an impact in just two weeks at our partnered site?”, “How am I going to do living abroad with five other strangers?” and “How are we going to communicate In a foreign country?”. These were just a few of the questions at the top of my list. Our first tea time experience occurred with our host and her family upon our arrival in Chandigarh. My team and I were excited to meet the person we would be working with for the next two weeks, although unspoken, I suspect we all had nervous butterflies as well, along with a zillion questions. But then tea was served… a wonderful concoction of spiced tea and milk. Holy masala chai… the taste was magical, a perfect blend of spice and sweet. You would think drinking the delicious tea would be enough in itself, but oh it was so much more. Cultures were being merged, guards were being dropped, laughs were being heard, and relationships were being formed, as I looked around and absorbed what was happening. In a blink of an eye and a glorious cup of masala chai later, all my reservations quickly dissipated. Over the next two weeks, tea time would become our favorite past time. It didn’t just take place once a day, but throughout the day. It was a time we collaborated about our work at SOREM, shared our wins, our frustrations, changes we would make if we could, or just simply a time to be. 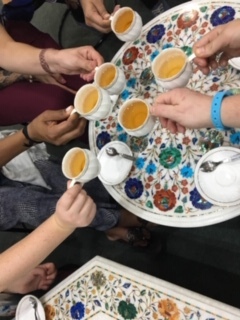 For us, tea time in India was so much more than just a cup of tea, it was a time of creating unforgettable moments and forming lasting bonds… from having homemade tea brought to us daily at SOREM, to milking our own cow and having tea made with it …”tea time“, those words won’t ever be the same for me.